I have had an occasional interest in the 1983 videogame Tapper. 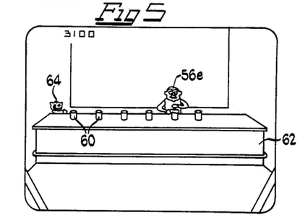 But I did not know, until recently discovering it by accident, that its designers had patented the game [pdf]. 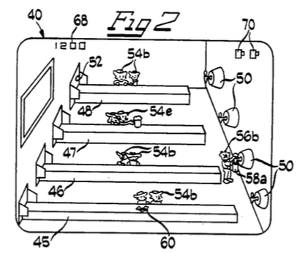 Leaving aside the oddity of patenting a game design, the patent document itself is remarkable. In Tapper, the player is a bartender who fills up mugs of beer, and serves customers by sliding the beers down one of several bars. The customers move along the bars towards the bartender; serving a customer pushes him back towards the door. The goal is to push the customers out of the bar without letting any reach the bartender. You can also play it on an emulator at the Internet Archive. Despite its simplicity, the game is interesting for formal analysis of videogames. The abstract mechanics, concrete on-screen movement, controls, and graphical skin all combine to make the game what it is. And you can change both the gameplay and how the game is "read" considerably by making discrete changes to any of those (see link above). A patent document is nothing if not a formalist description, so you can see why I was intrigued. Tapper is a game about: a host image repelling ravenous images by serving filled vessels! A succinct, evocative summary of the game I can wholly get behind. The slippage between technical and in-game levels of description is intriguing. The bartender and customer are described in an abstract, semi-technical sense as just images. But rather than continue with that dry language, one of these images is described with the vivid adjective ravenous. Then things turn abstract again: the ravenous images aren't sated by beer but by filled vessels. One possible skin is to have the host image bartender repel ravenous images bar customers by serving them a specific kind of filled vessel, beer mug. But there may be other skins, so long as they respect the constraints implied by the adjectives and verbs. The images being repelled must be something that could be perceived as ravenous. There must be some kind of filled vessel that a suitable host image can use to repel the ravenous images. And this vessel must plausibly satisfy the ravenous images' desire for the contents with which it is filled. Midway themselves issued a reskinned version a year after the initial release, although it was a euphemistic reskin that hardly succeeded in changing much. Some authorities frowned on a beer-serving game being placed into arcades frequented by minors, so Midway came out with a rather improbable reskin of the game to Root Beer Tapper. But more significant reskins would make it a very different game; a lot of the "feel" of the game relates to the bartending setting. 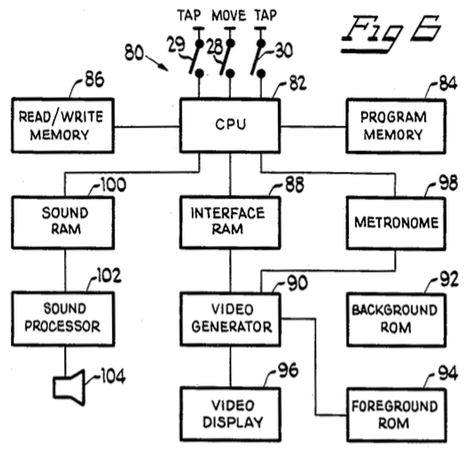 Just from the patent's title, a procedural generator of "U.S. Patent 4,643,421 games" suggests itself. The patent does not settle for only the style of an abstract-yet-evocative read of the game. The next read is a more matter-of-fact, descriptive summary of gameplay, along the lines of the one I gave at the beginning of this article, but longer and more detailed. And, now it's a description of the concrete gameplay of Tapper specifically, rather than a space of games. This description serves as the patent's abstract. That fact is itself mildly interesting, since the abstract is nothing but a gloss of gameplay, not attempting to describe it as a machine or device (as some of the later parts of the patent do). This text could be almost equally at home as a blurb in a videogame catalog. 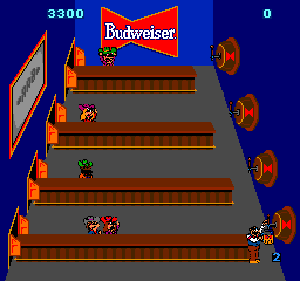 A video game in which the player must fill mugs from a keg and slide the filled mugs down a bar to advancing thirsty patrons to repel the patron out the bar. The player controls movement of a host image from one horizontal bar to another and laterally along a bar plus the filling of mugs. If any of the thirsty patrons reach the keg end of the bar the player loses a turn. Repelled patrons are delayed while drinking and then return the empty mugs. Unless the empty mugs are caught by the host the player loses a turn. A turn is also lost if the player serves a full mug and there is no thirsty patron awaiting it. From time to time a tip will appear on one of the bars which the host image may pick up causing dancers to appear for an interlude during which some of the patrons turn to watch. While watching the patrons neither advance nor are thirsty. Bonus entertainment racks are periodically introduced during which six cans are displayed. 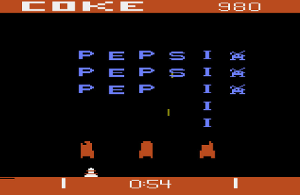 Five of the cans are shaken and the cans then exchange positions after which the player must select the one unshaken can to obtain bonus points. This abstract is a bit more colorful than one might expect from a patent document. Apart from the rather pedantic insistence on describing the player as controlling movement of a host image (an attention to the player–avatar distinction that some game-studies scholars might appreciate), much of the summary is written as an in-universe explanation of what these advancing thirsty patrons are doing. In any case, not much here sounds like a technical invention, though it certainly does sound like a videogame. Field of invention: Is Tapper a shooter? This invention relates generally to games and, more particularly to electronic video games of the type where a player controllable image moves and directs projectiles at advancing opposition. In the popular prior art Bally Midway SPACE INVADERS video game generally horizontal lines or waves of alien images move from side to side and advance down, line by line, toward a defending image which can shift from side to side and fire up at the alien images to destroy them. The SPACE INVADERS aliens fire their own projectiles at the defender and there is a spaceship moving across the screen above the lines of aliens which the player tries to shoot in between the aliens to score bonus points. However, there remains a need for games that challenge players to control movement of a defending or host image and repel advancing opposition by means of player controllable projectiles in a nonviolent entertaining manner that is neither fatal to the player controllable image or the opposition. The answer is that Tapper innovates compared to previous shooters such as Space Invaders because it is a nonviolent shooter, in which the projectiles are not fatal. I must confess that this seems like a bit of a stretch for explaining why it's a patentable invention, but then I am not a patent lawyer. It is an interesting read of Tapper, though. I previously described the game as being in the genre of order-fulfillment games: games in which the player needs to fulfill customers who demand to be served, under time pressure. Diner Dash is another game in that genre. The patent's title also has a similar flavor. Calling the genre order-fulfillment categorizes the game by its abstract mechanics, which describe the gameplay as consisting of requests being fulfilled under time pressure. But calling it a nonviolent shooter instead categorizes it by the concrete mechanics: the player is slinging beer mugs as projectiles, and they have their effect by colliding with the target. So this "field of the invention" section provides a nice alternate take on the game's genre: it's an order-fulfillment game mapped onto shooter-like mechanics. 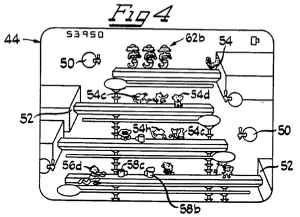 The rest of the patent has an odd flavor of repetition with ever-increasing detail. The gameplay description from the abstract is taken as a sort of template that is iteratively expanded to form subsequent sections. The first instance of repetition comes in the patent Summary, which restates the Abstract (many sentences are verbatim the same) but at approximately twice the length. Next, the Summary is further elaborated in the Detailed Description section, balooning by another 8x or so, and pulling in a few technical features of the arcade machine in that version. And finally, the game's design is recapped in highly stylized form in the formal Claims section of the patent. This style of repeatedly elaborated gameplay description, using the same explanation but bringing in ever more detail with each retelling, would be a nice concept for a software studies piece. Repelled patrons are delayed while drinking and then return the empty mugs. Unless the empty mugs are caught by the host the player loses a turn. That's clear enough, but doesn't specify all the details. How are the empty mugs returned? What does the player have to do to catch them? What happens if a patron is repelled all the way to the end of the bar? A patron is repelled back an incremental distance toward the door end of the bar upon being served a full mug. When the patron is repelled to the door end boundary, the patron is ousted but reenters the bar after a predetermined delay. If not ousted, the patron's advance is delayed while the patron consumes the contents of the mug. When the mug is empty, the patron returns the empty mug back down the bar toward the keg. The player controlled host image must be moved to intercept and catch the empty mug before it falls off the keg end of the bar and breaks. Should an empty mug fall and break the player loses a turn. This is getting more precise, but is still not enough to unambiguously implement the game. What's the spatial layout of the bars, customers, and patrons? What precisely does it mean for a host image to "intercept and catch the empty mug"? Does the player have to press a button? Just be in the right place? Can they catch an empty mug at the same time they're serving another one, or only do one at a time? Upon an advancing patron such as the cowboy 54e in FIG. 2 receiving a filled mug 58b, the receiving patron will be moved or repelled back toward the door end of the bar a predetermined incremental distance. If the patron is moved to the boundary at the door image 52, the patron goes off screen for a predetermined time interval and then reenters the same bar at the door 52. However, if the repelled thirsty patron remains on screen, the patron will then be shown in a drinking pose 54f as in FIG. 3. When the patron, after a predetermined delay, finishes drinking the beverage, the empty mug 58c, is slid back toward the supply or keg end of the bar. If an empty mug 58c reaches the supply end of the bar and the host is present in any of the wiping, filling or serving poses 56a, b and c, respectively, the empty mug will be caught. The player also has the option of moving the host laterally along the bar to intercept the empty mug as in FIG. 4 where the host image is displayed in a running action post 56d. When the player successfully positions the host image to catch an empty mug 58c the player earns One Hundred points. However, if any empty mug 58c, in the absence of an interception, should reach the end of the bar and the host image is not there to catch it, the empty mug will be depicted as falling off the bar and breaking (not shown) and the player will lose a life or turn. If you liked those two paragraphs, the full 5000-word detailed-description section is really quite a read. It describes every aspect of gameplay at that level of detail, and has the flavor of prose-structured pseudocode interleaved with an extremely pedantic walkthrough. means displaying the ravenous image emptying the filled vessel and then returning an empty vessel toward the supply image if the ravenous image has not been repelled beyond the boundary image. 4. The game of claim 3 including means terminating a player turn if the host image is not moved to intercept the returned empty vessel. 5. The game of claim 3 including means immobilizing the advance of the ravenous image during display of the ravenous image emptying the vessel. Turning back to to the included figures gives us a few more looks at the game. U.S. patent law requires accompanying drawings, in cases "where necessary for the understanding of the subject matter sought to be patented" and "when the nature of such subject matter admits of illustration by a drawing". There are at least three very common types of patent drawings. The first is simply a drawing of the invention being patented, usually a machine or other apparatus. These are typically line drawings, with parts labeled for reference in the text, executed in a roughly realistic style and to approximate scale. The figures reproduced thus far (Figs. 1–5) are of this type. Here, the apparatus is mainly a non-physical one—a videogame—and the labeled "parts" of the apparatus are images that move on screen in order to effect its operation. Figure 5, for example, has parts such as "host image" (labeled 56e) and "bar image" (labeled 62). Figure 1 is a more conventional apparatus drawing showing the physical arcade cabinet and its parts. A less literal type of illustration, also common in patents, is the block diagram. In a block diagram, labeled boxes show the main components of an apparatus, and links between these components show functional relationships. This is intended to show the conceptual makeup of a machine and how its parts fit together functionally, rather than what it physically looks like and how its parts fit together physically. Figure 6 provides another read of Tapper. It is a machine made up of 11 major internal components, including a CPU, several kinds of RAM, two ROMs, etc. This machine has three levers by which its operation can be manipulated: TAP MOVE TAP. The player sits in the driver's seat perched precariously atop this contraption and operates those levers, issuing TAP MOVE TAP instructions to components such as METRONOME and SOUND RAM. 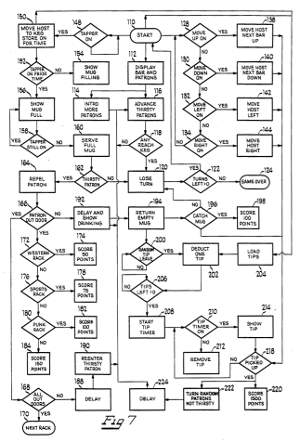 Finally, a third type of diagram commonly found in patents is a flowchart showing the logic of a machine's operation. While the previous two types of diagrams illustrate a machine statically, a flow chart shows the dynamic operation of a machine as it moves through different states and modes of operation over time. Since this patent has so far wavered between describing an arcade machine (i.e., computer), and describing the videogame in terms of its gameplay, the logic of the machine here could be either a computer's logic or a game's logic. The only flowcharts included, however, are for the game's logic. Giving a satisfying visual representation of a game's logic isn't an easy problem. Some proposals include the visual game grammars of Raph Koster and Stéphane Bura and the game feedback diagrams of Joris Dormans, but I think it's fair to say no single approach has really caught on so far. 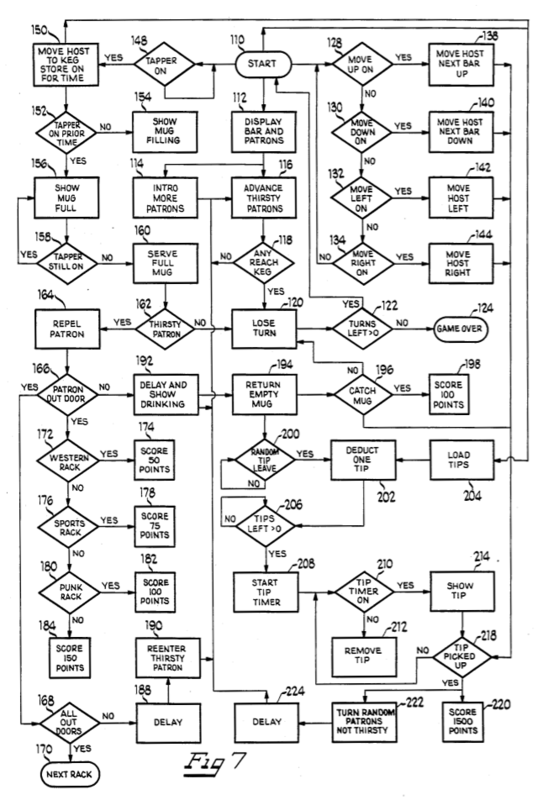 For Tapper, however, the game logic is simple enough that the patent writer was able to diagram it using only basic flowchart symbols, as found in many other patents. The game's logic is a visualized as a graph of nodes with directed edges. Each node is either an action node or a conditional node. Action nodes describe something taking place in the game and have one outgoing edge, which leads to the action or condition that takes place next. Conditional nodes test a condition and have multiple outgoing edges; one of these is taken, depending on the outcome of the test. Figure 7, diagramming the overall game logic of Tapper, is the only time I've seen someone draw out the entirety of a game's logic as a flowchart, even for a simple game. My initial reaction to discovering the Tapper patent was that it seemed like a hilarious parody. There are many silly patents, but this patent isn't silly in only the usual way, that it proposes an invention where I'm skeptical patent protection is really in order. It reads parodically because it seems to be describing the wrong thing entirely: It takes the formal structure of a patent, which is most at home when describing machines and other devices, and uses it to write a strange kind of gameplay summary and walkthrough. Summary of the invention, detailed description of its preferred embodiment, diagram and block diagram of the apparatus, flow chart of its operation, list of specific claims, etc.—where each of these is just explaining the gameplay of an arcade game in which you serve beer! But, in my opinion, this exercise in describing gameplay through the lens of patent structure ends up being very interesting. It's inadvertently carrying out a really detailed formalist analysis of the videogame, which sheds light on it from several angles. Especially interesting is that, while very detailed, it also has a strong push towards abstraction and generalization. The format requires it to remain at the level of prose description and diagrams, not the game's source code or circuitboards. The need for a patent to describe a general invention rather than just a specific game contributes to this abstraction push, not least resulting in the excellent title, worth repeating: "Video game in which a host image repels ravenous images by serving filled vessels". Besides the imagery of ravenous images, parts of the document even have a literary feel. You read, in deadpan voice, the same gameplay description that has appeared several times appearing once more, but in different form and with different registers of description. And the claims section feels a bit like glitch art. While I don't encourage anyone to attempt to actually patent their games, writing a patent for one might be an interesting exercise. Producing a complete set of patent diagrams and formal descriptions for a game can be proposed as an analytical method useful for shedding a certain kind of light on games through detailed description: a close "legal reading" of a game. Published version: Mark J. Nelson (2016). 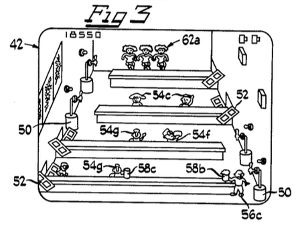 The Tapper videogame patent as a series of close readings. In Proceedings of the 1st International Joint Conference of DiGRA and FDG.